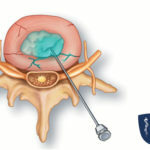 An extruded disc is a disc that has herniated in a specific way. This condition may cause acute pain or stiffness in the back and may radiate down the legs. The lower back is the most common location for extruded discs because of the stress and strain put on this part of the spine throughout the day. However, this condition is both preventable and treatable. Once a physician understands where and how the pain was caused, the physician can find the appropriate spine pain treatment or leg pain treatment for the patient. Severe strain and natural degeneration with aging are the most common causes for extruded discs. As the body ages, vertebrae become more likely to rupture or expand. If one does rupture, the intervertebral disc’s gel-like center may be displaced into the spinal cord. 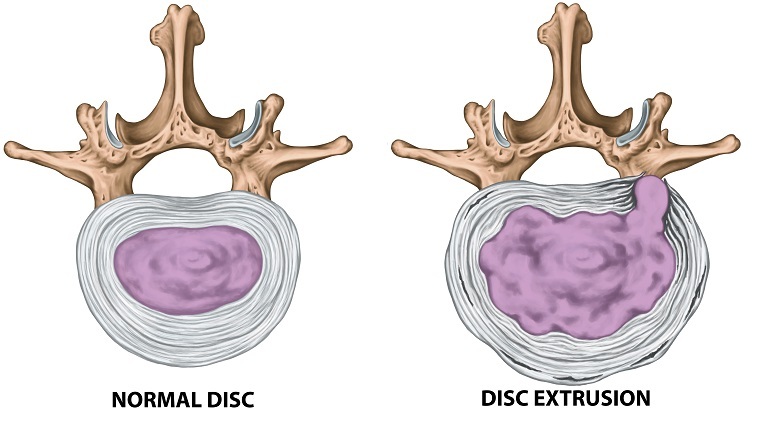 If severe or left untreated, the extruded disc can become a sequestrated disc. In this case, material from the disc can end up in the spinal canal causing numbness and nerve pain. Treating extruded discs caused by injury usually begins with the recommendation of a non-steroidal anti-inflammatory drug (NSAID) with rest. If conservative treatments fail, a minimally invasive surgical option exists. To prevent disc injury, maintain proper posture. Regular exercise can build core strength to help prevent spinal degeneration. As well, a calcium-rich diet can strengthen discs.